These canapes are easy to make and easy to eat! 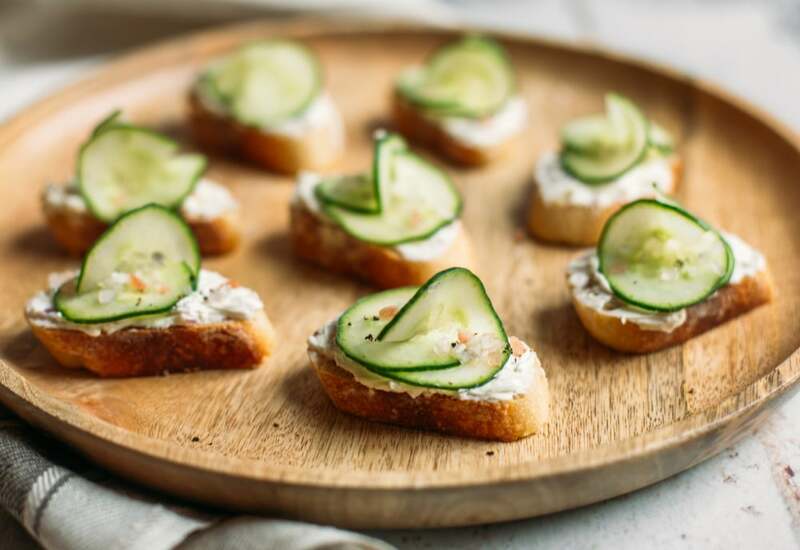 Bring these open-face sandwich bites to parties for a tasty appetizer that will make you the hit of the party. Using only 5 ingredients you will have a fancy appetizer with very little prep needed. Try different vegetables in place of the cucumber, like thinly sliced zucchini or red bell peppers. Try different flavors in the cream cheese spread. Add roasted garlic, fresh garlic, or caramelized onions to the mixture before processing in the food processor. Use goat cheese instead of the cream cheese for an extra creamy flavor. If you like salmon, stir some smoked or canned salmon into the spread after processing it in the food processor. Per Serving: 215 calories; 11g fat; 23.9g carbohydrates; 6g protein; 29mg cholesterol; 407mg sodium. I made these appetizers for my friends baby shower and it was a hit! She had a co-ed baby shower so I was a little worried about what the guys would think of this delicate looking appetizer, but they ate more than the women did! So good, especially the cream cheese.